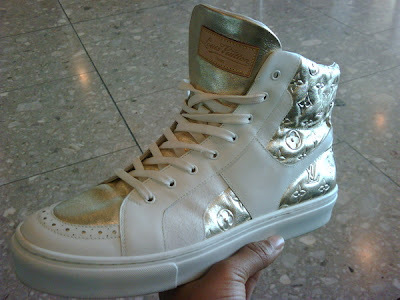 B is Another YSL Bird Cage Shoe Rocka! Thanks to Concrete Loop we have a status update images of B, on her European tour, before she brings it back to the bottom of the map for touring, in the US. 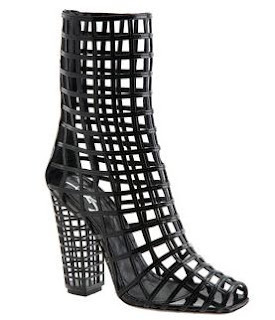 Beyonce is wearing the uberpopular full YSL Bird Cage Shoe in silver, which was originally blogged by Notonik on this site back in March 29, 2009 when Lil Kim was taping her new vid, wearing an ankle version. Click here for the post. Click here for more YSL posts. 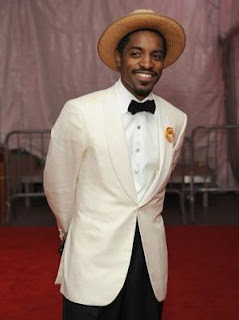 The particular version that B is wearing is only available for "special" customers via telephone and/or Stylist Request. 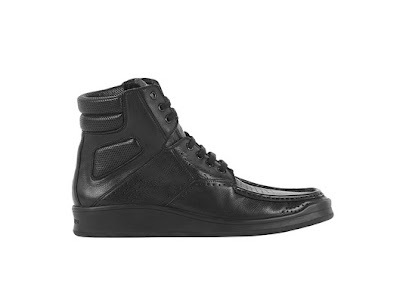 If you are stateside there is a black leather version of this shoe available at Barney's New York. Price - $1590. 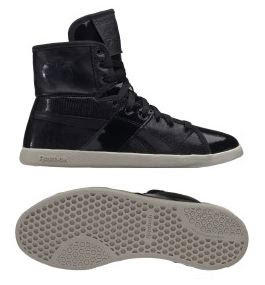 For a lower budget, similar version, check this Steve Madden option for $99.95. J. 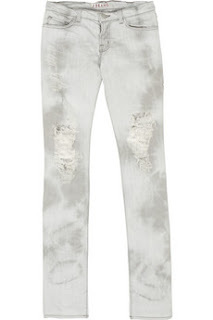 Brand jeans seen worn on Beyonce available through Notable Service. Price - $218 + shipping. $260 for sizes 31 and 32. 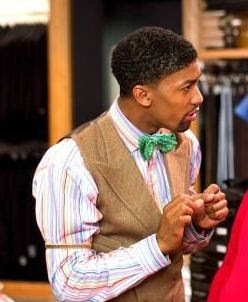 Don't Bother to Tie a Bowtie! 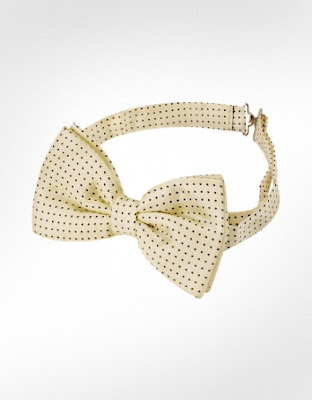 If you ever have a need to wear a bowtie or feel like channelling a little bit of Andre 3000 or Farnsworth Bentley fashion flair, I have several bowtie options for you. Price points start at $42. There are more color combinations and solid colors that are not featured here. Contact me at Notable Styles & More. Combat the April Showers with Juicy C! 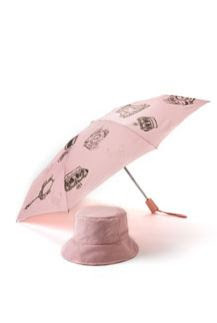 Juicy Couture has a pink rain hat and umbrella set. This set is also available in black. Price - $85. 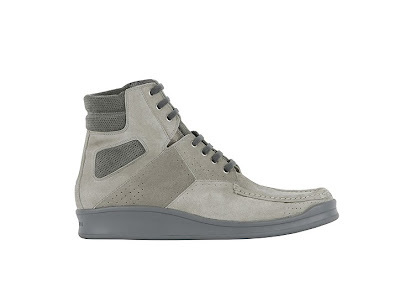 Go to Nordstrom.com for the purchase. 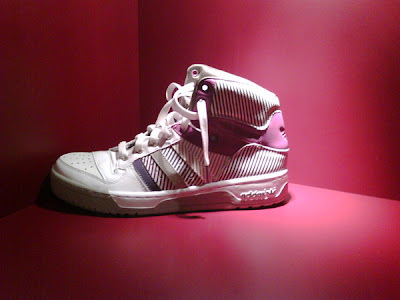 Keri has decided to be her own publicist and release exclusive pics of her FIYAH tennis shoe game! Check out some of the pics below. 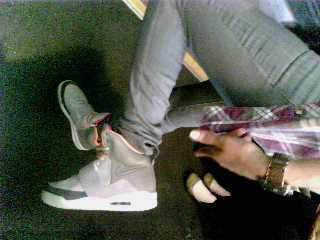 Her favorite pair from London are the Adidas, the Louis Vuitton, of course speaks volumes and the Nike is the HOT Air Yeezy!! 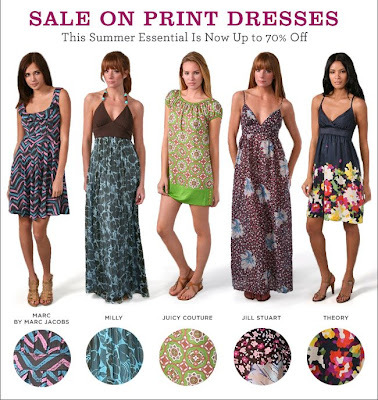 Shopbop: Summer Dresses 70% OFF!! The summer weather is just beginning for some but the need to deplete summer apparel inventory is starting NOW for retailers. 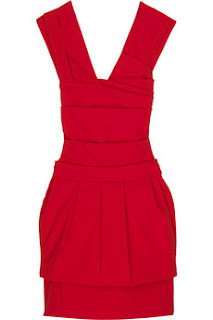 Visit shopbop's link for your summer sale dress selection. 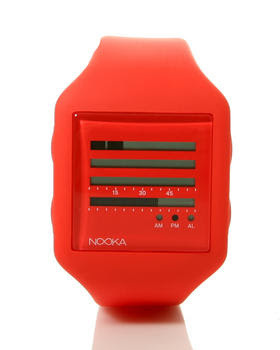 Nooka has an innovative way of telling time, for the technically savvy male. The shell of the watch is very unique and colorful. The interface breaks the time down into 4 rows. Row 1 will show you hours 1 - 6. Row 2 will show time for hours 7 - 12. Row 3 will show the user what minutes in the hour have passed. And Row 4 is for you to find out. I think this watch is worth purchasing. 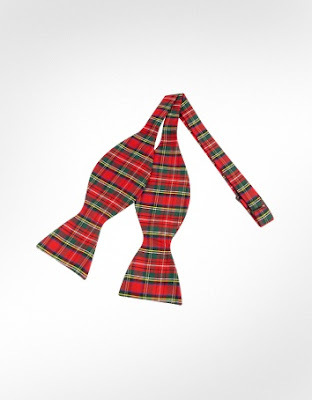 It will add a distinct flair to your attire and shed some light into your own individual style. 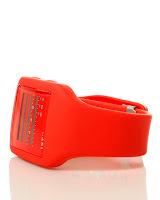 This watch is available on DrJays.com. Check out the new Cricket Collection from Coach. It is BEAUTIFUL!! The collection is full of leather and patent leather workmanship and offers a range of colors from the spring seasons color palette that will make your lady, family member or friend, smile. Price points start at $188. 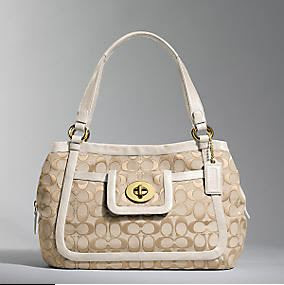 Coach is bringing forth satchels, large satchels, clutches and sandals, with this collection. First of all, Im SO LATE on this post today, that I feel a little jumbled about having to alter my post time. But all is well, and if you cant adapt to change, then, what can you do? Anyway, this is Earth Week, a national awareness week of all things that you can do to preserve and conserve the earth. This awareness spans across ALL industries, automotive, apparel and accessories, manufacturing, etc. There is a Mad Imports clutch that I would like to show you. This clutch is earth friendly. I like this clutch because it comes in 2 different colors. One with muted color (Espresso) and one with color that pops (Purple Combo)! 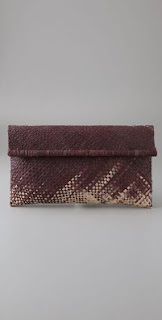 This clutch is woven and price points at $80.00. Contact Notable Styles & More Services for more details. 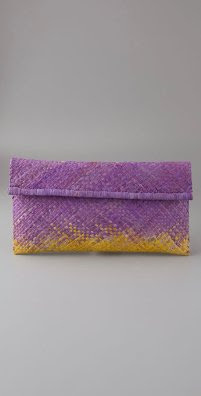 Budgetista Tip: If you happen to find a woven clutch that you like in B+ or better condition in the vintage store, consignment shop or Goodwillesque type stores, get it. It will be substantially cheaper and a good steal. A way to be in fashion, for a low fashion price. Fire Shoe For Under $40!!! Dollhouse Tadita Suede Platform Shoe for $39.95 is one of my recessionista requests. 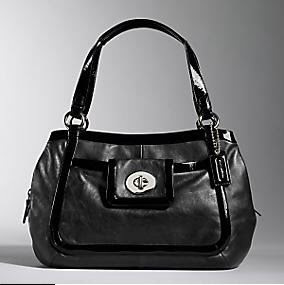 A Total Budget Fashionista Favorite!! 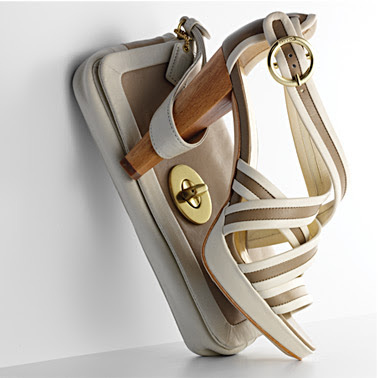 This shoe is PERFECT for style, fashion and your wallet. Email me I.M. Notonik for more details on where to get it. Smooches! 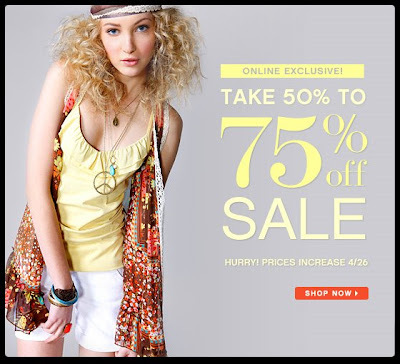 Take advantage of this Charlotte Russe coupon for 75% OFF apparel. Usable until 4/26. You can surely find something for 75% off! 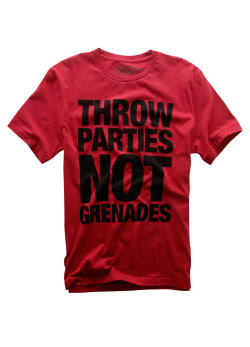 If you would like one of these, get at me, I have them in XSmall, Large and X-Large. $25.00! Email me here. Victoria Secret Pink Tee - Says It All! Happy Monday, Notable Styles dudes and dudettes!! 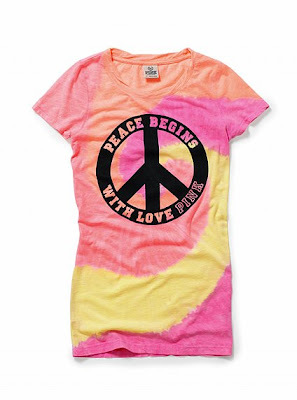 Victoria Secret Pink has produced a fashionable tee, that says "Peace....." on top of a tye died backdrop. Cop it. The dress pictured below, really caught my attention, while I was online doing apparel searches. I feel the material choice is excellent and the workmanship of the silk accents the colors in a gradient format geniously. 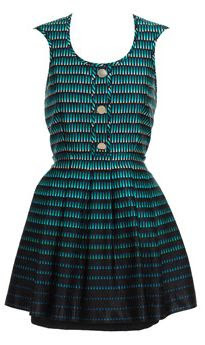 The price point of this Jonathan Saunders dress is near the $1500 mark, but please, do not focus on this. The style of the dress compliments most figure types and this is very important to note. If the price is out of your comfort zone, come back to check the blog frequently, because I may present a more budget friendly option for you, soon. BUZZZ, all about the net is that Drew Barrymore pulled two very "bad" looks within the past week, whilst out promoting her new movie. As a fashion stylist, I wonder do these spectators realize that fashion is only partially about whether or not someone else actually likes what you wear. As a matter of fact, as a celebrity or anyone else for that matter, you don't have to care what your audience thinks AT ALL about your fashion choices. REITERATION: Fashion is a personal expression of how you are feeling, what message you would like to convey and the mood that you are in. What do you think about Drew's looks Notable Styles Readers? Are they a Green Light (Go, forward fashionista) or a Red Light (Stop, no entry will be allowed). My vote is Green and Green! We have pictures of Rihanna - SPOTTED in the new Christian Loubs. Link to original post of product. I picked these shoes out before Rihanna was seen with them on. Once again, Notable Styles was ahead of the trend curve. Picture courtesy of Who, What, Wear's, What Was She Wearing segment. Puma and YSL - What a collaboration! In more Puma news, they have collaborated with Yves Saint Laurent, (a sister company) to present a fresh and flavorful shoe for men, just in time for Spring! 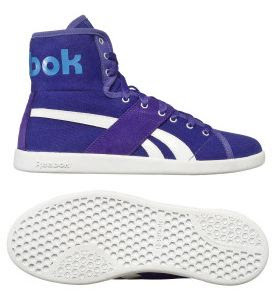 But this shoe is one exclusive hot tamali. 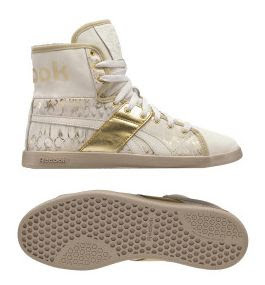 So fellas, the dream girl that you want, IS THIS SHOE! Only fashions top guys will get this one. And email Noto Nik, because I know how to get it for you. Puma now has its own motor sports website and it is pretty interesting. Go here to visit their site. Please tell me, that you have never wondered, where did someone walking past you, get something they were wearing. And some of us, are not ashamed to walk up and ask. Others may not be as bold, but can secretly snap a pic from the camera phone. But with, wheredidshegetit.com, you can upload any picture and pose the question, where did she get - that dress, that shoe, that top, that coat, etc? With the hundreds of registered members, someone will hopefully, be able to answer your question. And if not, keep uploading and keep searching for the fashion answers yourself, because this circle of fashion, makes the world go around. New vocabulary word - WDSGI means, where did she get it. When used by Notable Nik on this blog or any of my other media outlets. 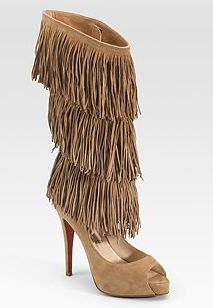 Today, I read that Kourtney Kardashian, received some fringe, Christian Louboutin booties for her birthday. And I began to wonder....which pair did she get? Did she like them? Im sure of it! She appears to be a fashionista with GREAT style that knows and appreciates quality shoes, accessories and apparel when she sees them. 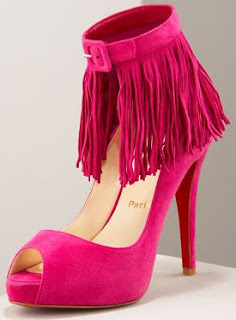 I have posted images of some of the suede, fringe Louboutins from S/S 09 collection. Thanks Kourtney K for the inspiration. P.S. Try any of these fringe fantasies with this Preen Power bandage dress. For more info on anything in this post, email me at Notable Nik or leave comments. Topshop is a boutique for men (Topman) and women, that has only been accessible (prior) to those whom travel to London. But, as of April 2, 2009, they are NOW in NYC!! 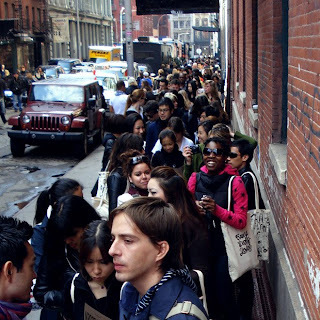 And of course, the drones of people waiting inline to go inside were of enormous quantities. Topshop NYC 478 Broadway (Broome) Soho New York New York, New York 10013 Links to other Topshop posts. Tennis Shoes and a Dress by Leighton Meester!! Leighton Meester BKA Blair Waldorf of Gossip Girl, has a Reebok Top Down sneaker that I think is cute, fashionable and very marketable. 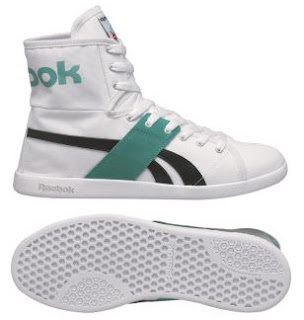 I am destined to have a pair. 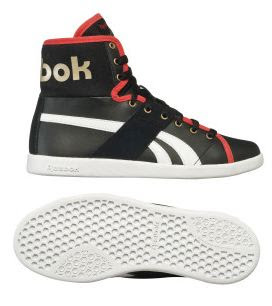 See the pictures below to see the sneaker and how to rock it with a funky edge as well. The sporty way to wear this tennis shoe, is equally as easy. Michelle O's Top Looks from recent travels! Members Only Jackets are ON SALE!!!!! Nighttime Dress for the Recessionista! H&M | Matthew Williamson Drops - April 23rd!! Tracy Reese & Twenty8Twelve - So Romantic!! !